Standing in line for soft-serve ice cream at the Merla-Mae ice cream shop is still one of my fondest memories of growing up in London, Ontario. A dispenser, shaped like a mini Ferris wheel, crushed peanuts, which would then tumble evenly onto the chocolate coating of my chocolate-vanilla-twist ice cream cone. The delicately adorned dessert was called a tree cone for its resemblance to a Christmas tree. That cone is still the image that flashes across my mind as a symbol of the way certain tastes take us back to the simple delights of being a kid. And the painted sign posted beneath the menu that read “Through these windows, we serve the finest people in the world, our customers” drew my attention to the people waiting in line. For the first time, I noticed the unique way people behave in a sweets shop. Children bounced and giggled; couples caressed and kissed — it was as if the mere thought of ice cream inspired affection. All these years later, living in an age when cellphone cameras often snap the first bite, I still find my inner anthropologist emerge whenever I’m waiting in line for sweets. When I set out to write this column, I began with a bit of a bias. I wanted to investigate the conflicted love affair with sweets that has been unfolding around the city (and within myself). Ottawa is experiencing a dessert boom, an explosion of traditional and modern sweet purveyors tempting even the gluten-free and vegans among us with doughnuts, cupcakes, squares, chocolates, pastries, and whoopee pies. The latest addition is Macarons et Madeleines. My hunch was that what’s in fashion in the world of sweets would reveal something about what’s happening in the wider cultural landscape. For one thing, we’re seeing a desire for novelty and an obsession with individuality. I might be reading into it, but reflected in the beer frosting of a cupcake and the DIY-toppings buffet at self-serve fro-yo shops is the notion that every individual is different and special — and desserts should be too. The fact that treats are becoming more complicated even as they promise us the sweet simplicity of Grandma’s kitchen is an irony not lost on me. Consider the rise of a pastry innovation in which two distinct dessert worlds collide. I’m thinking, of course, of the famous croissant-doughnut hybrid, the Cronut, as well as things like green tea macarons, Nutella-stuffed rice balls, and s’mores pancakes. We are seeing both a desire for novelty and an obsession with individuality and customization (hence the rise of treats turned out in “limited edition”). Perhaps there is no better example of this phenomenon than Holland’s Cake and Shake in Hintonburg. 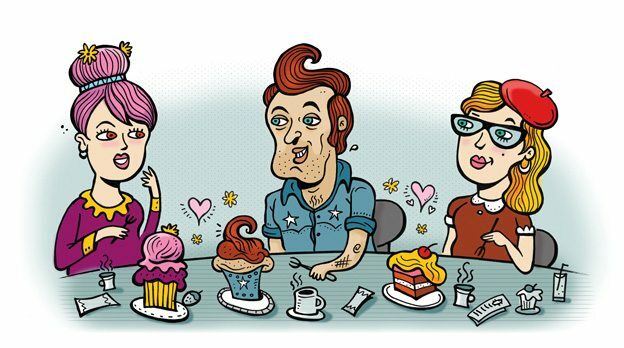 Customers appear to be tickled by the idea of tasting treats from childhood in new, creative forms — a red licorice tart, say, or an iced vanilla cake crowned with Froot Loops brittle. 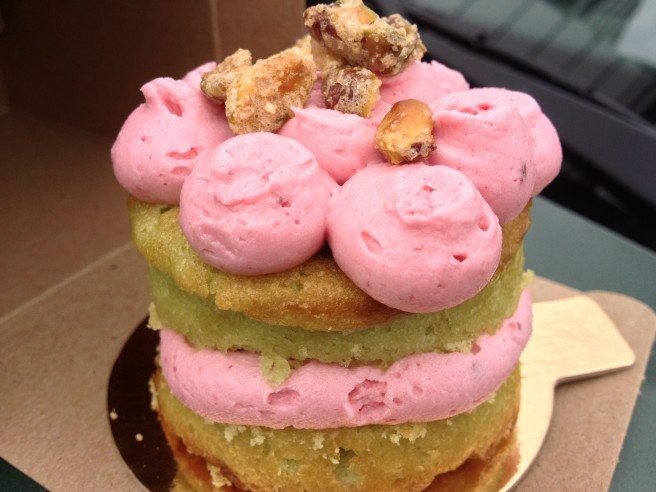 Then there’s the cake shake, an idea that started as a joke by pastry chef Michael Holland, the shop’s owner. He decided to combine the shop’s two namesake items into one, allowing customers to choose among the weekly miniature layer-cake options as well as one of the day’s homemade soft ice cream flavours — that means at least 12 possible combinations. It all gets whizzed together into a milkshake. For the indecisive glutton, Holland created The Overlord, a large cake shake adorned with a tower of extra treats, including a whole cookie, another cake, a chocolate brownie, and an Elvis truffle (made with white chocolate, peanut butter, and banana, topped with bacon bits). To make this caloric masterpiece into a true spectacle, it’s served speared with a lit sparkler. I marvel at anyone who has the nerve to order such a sugary beast, because I tend to sympathize with those who sidle up to sweets counters and find themselves muttering to the clerk, tossing out every excuse they can think of to explain and justify what they are buying. “It’s not for me — I don’t like sweets” or “I won’t have any dinner tonight.” Shame seems to ooze out of us like cream from inside a Cronut. Holland says he added little signs identifying the different cakes to help make decision-making less daunting. Still, he wants the experience to be personal, and he and his staff are always standing by to answer questions about specific items. But as Holland acknowledges, some people really want to talk and others prefer just to point and pay. The most trouble-free transactions occur on Fridays, when Holland posts a photo of a treat “available today only” on Twitter. He watches the wave of customers who come in to order it, revealing themselves because they don’t bother to browse the rest of the menu. If you tweet it, they will come. I asked Holland if he has ever been surprised by customer behaviour. That’s when he told me about the couples who come in together and then return separately. 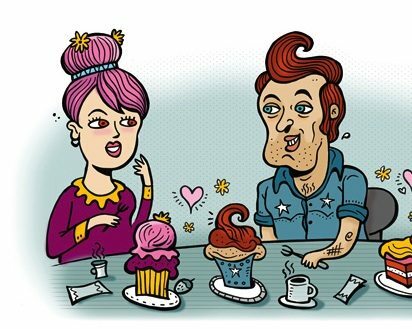 He says these individuals express frustration about compromising on choice or sharing a certain cake with a spouse on their former visit. They say they have come back so that they can get whatever they want. It makes perfect sense. Like hitting the “like” button on Facebook, we live in an age in which expressing personal attachment toward certain pleasures has become more important than the pleasures themselves. These days we not only yearn to find and share tasty treats, but we expect some kind of epiphany too — a moment worthy of being broadcast. That might explain our return to innocence when it comes to the anticipation of something sweet. As for the more introverted sweet lovers among us, I guess I’ll see you in line.